The website, powered by Agility's Publishing Package, launched in December 2012. 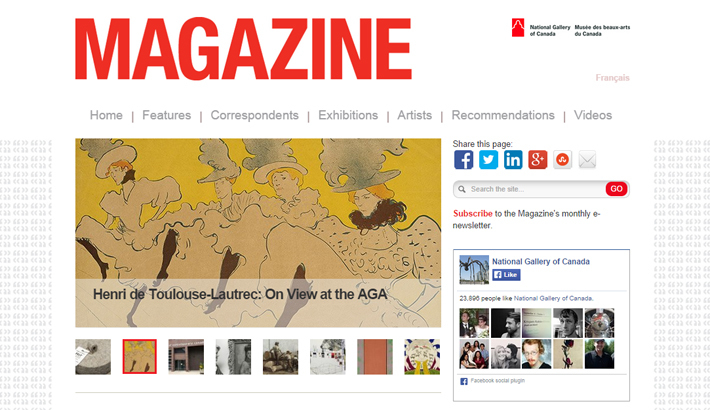 The NGC Magazine serves as the go-to source for information about the world of Canadian art and events taking place at the National Gallery. National Gallery is the only Canadian museum or gallery that offers a free, bilingual magazine to art fans that is updated frequently with exclusive content that includes interviews with artists, videos, photo galleries and much more. Additionally, the site is fully responsive for an easy-to-navigate and optimal user-experience across desktops, tablets and phones. Readers can also seamlessly engage with the site's content with social sharing capabilities and comments. The site is now being recognized by the Canadian Online Publishing Awards, an event that celebrates the very best in online content created by Canadian publishers, corporations and marketers. For more information about the COPAs, visit their website.